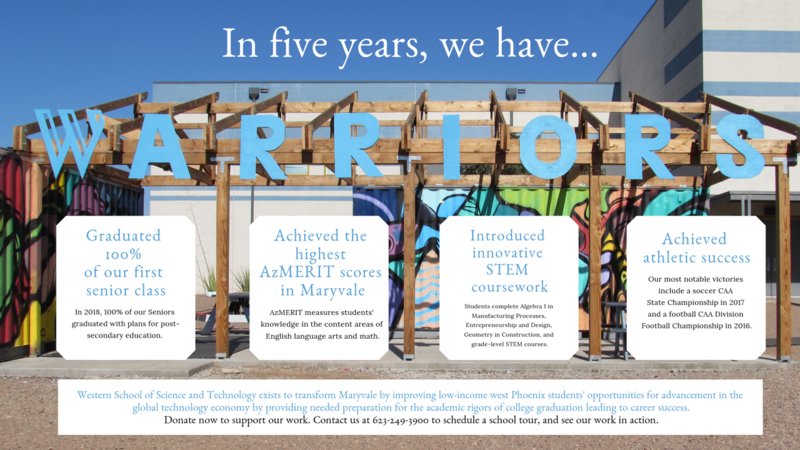 Western needs YOU to support our continued success in Maryvale. We have launched the Warrior 2020 Campaign to sustain enrichment programs that promote the academic success and extracurricular interests of our students on the Western: CFA campus. Our school community has established a rigorous college-preparatory curriculum that is relevant to the needs of 21st learners, while enrichment programs further cement the pathway to high school graduation, college graduation, and career success. Programs such as college campus visits, numerous team sports, and hands-on STEM curriculum are critical venues for our students to expand intellectual curiosities and explore new career pathways.